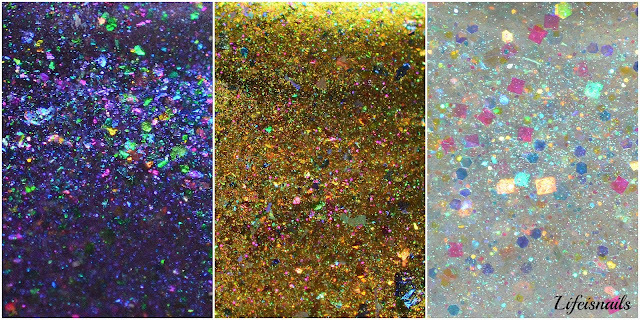 Today I have Dollish Polish "The Dark Crystal Trio" to share with you! First is The Crystal of Truth: Inspired by the crystal itself and all its power, this shimmery Amethyst duo chrome jelly, flashes from aqua to fuschia. Loaded with micro glitters and ultra chrome flakes in shades of fuschia, indigo, amethyst, emerald, gold and bronze. The first coat was sheer, but it built up nicely with the 3rd one. Shown here is 3 thin coats with top coat. The Prophecy of Jen: Inspired by Jen and the family of Mystics who raise him, this is an intense bronze duo chrome, flashing from pink to green, with micro glitters and ultra chrome flakes in shades of green, olive, bronze, gold, copper and indigo. Shown here is 2 coats with top coat. Last is The Great Conjunction : Inspired by the restoration of both the crystal and the UrSkeks, this ethereal iridescent topper has a duo chrome base, flashing from blue to green with Rainbow crystal ultra chrome flakes, micro iridescent flakes, and varying iridescent glitters. Shown here is 1 coat over 2 coats of black and topped with top coat. This trio will be numbered and come with its own description art card. The Trio will launch on Monday, August 3rd and will be available for that month only, or until they sell out, whichever comes first. This trio set is for $32.